Please I'm new to Arduino and I need assistance. I'm working on a project which makes use of the ultrasonic sensor to make a certain pin high if a certain distance is attained. When I used the USB port to power it up it worked fine. When I use external power(tried two different 9V microphone battery) it's not giving desired result. Now I want to try using just the Atmega328P on the board externally(separately from the Arduino). what voltage should I connect to the VCC of the Atmega cos I'm scared of damaging it. Am I going to power the ultrasonic sensor with an entirely different source from the VCC or I can tap from that same VCC source. That's max of 5.5V so don't use 9V battery without a voltage divider. To power the chip all you need is voltage to Pin 7 and GND to PIN 8. However, to get it to work after removing the chip from an Arduino Uno board you will also need a 16Mhz Crystal on pins 9 & 10. You will also need two 22pF capacitors on pins 9 & 10, each connected to ground. Without the Crystal you will most likely find that your sketches don't seem to run. Note: The red LED is connected just as a blink test (more on that in the article). What you need is a voltage regulator! There are many options to choose from linear regulators to buck (or boost) DC-DC converter. You can buy them from various sources as well. What could be the cause of the malfunction when I use external 9V battery? The ATMega can only handle 5V maximum, using 9V will either destroy it or engage protection circuitry that will prevent the chip from operating and being damaged. What voltage should I connect to the VCC of the Atmega?. 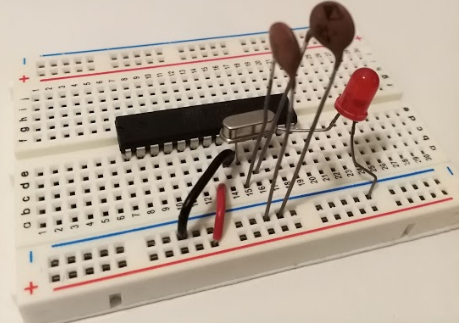 Most of the time an ATMega is powered with 5V, but depending on the clock frequency they can operate at lower voltages, the datasheet will have the details. Am I going to power the ultrasonic sensor with an entirely different source from the VCC or I can tap from that same VCC source? With the appropriate choice of powersupply you can power both the AVR chip and your sensor with the same power supply. Any other information I need to know using the ATmega on its own? Not the answer you're looking for? Browse other questions tagged sensors atmega328 electronics or ask your own question. Does a moisture sensor need warm-up time? Is it safe to power an MQ-7 gas sensor with a 9V D.C supply?